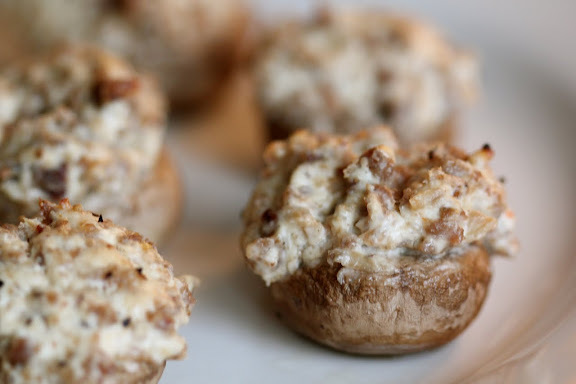 I've been dreaming about stuffed mushrooms for a couple weeks now! A while back some friends of ours served stuffed mushrooms at a get together they had and I couldn't stop eating them! I decided to try my hand at making my own and they turned out better than I could've imagined! I was totally surprised! I ate 5 right out of the oven! Love it when that happens! I was so excited with the results, I had to hurry and wrap some of them up and run out into the snow to deliver them to a few of our good friends! These delicious little bites would be an excellent addition to any of your upcoming holiday meals! Trust me!!!! Rinse and drain the mushrooms and set aside. In a medium fry pan, brown your sausage. Make sure you break the sausage up into small pieces as it cooks, (I chose to chop the sausage even finer after I cooked it) and then transfer to a large bowl to cool a bit. Remove the stems of the mushrooms making sure it leaves a nice little hole in the center of each mushroom cap. Finely chop all of the mushroom stems (thank you Pioneer Women for this cool tip:) and put them in the same fry pan used for the sausage. Add the minced garlic and cook over medium heat just until warmed through. About 1-2 minutes. Add your softened neufchatel cheese to the large bowl with the cooled sausage. Also add the cooked mushroom stems and garlic. Mix all of the ingredients together thoroughly. Now is the time to taste a little of the mix to see if you need more salt. I added just a tad. Seriously less than 1/4 teaspoon. But no pressure, your tastes may be different. :) Now, take heaping teaspoons full of the sausage mixture and fill each mushroom cap to slightly overflowing! 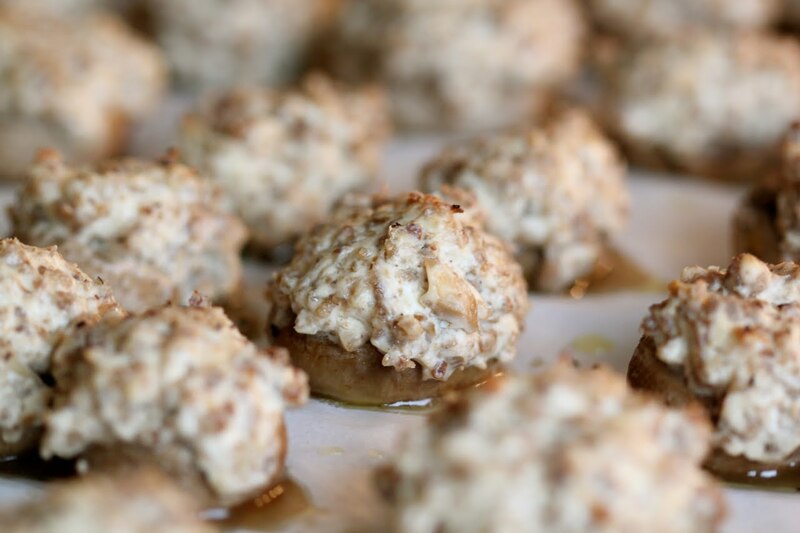 Place the stuffed mushrooms on a parchment lined cookie sheet brushed with olive oil. Sprinkle lightly with coarse black pepper. Pop in the oven for 20-25 minutes and then POP in your mouth! Tip: Wondering what to do with any leftover stuffing mix? If you have any leftover like I did (about 1 cup), put it in a pan with the leftover 4 oz neufchatel and begin heating it over medium low. Loosen it up with a little milk to make more of a sauce. Boil your favorite noodles. I used bow ties. Drain the noodles and mix them with the sauce and you have yummy stroganoff! Easy dinner last night folks! The stuffing recipe above could easily be substituted for Stroganoff instead of stuffed mushrooms. The only changes I would make: Use all 16 oz neufchatel and add milk a little at a time to get it to a thick sauce consistancy. Mmmm! My mouth is watering! Hmm, I was gonna say "pass" due to the fact that mushrooms are gross, but...I might have to make an exception. Or I could skip the 'shrooms and head straight to the stroganoff.